This node smooths the values of a mask to introduce a blur. To add a Smooth node, right click in the Graph Editor and select Create Node > Mask Transformation > Smooth. 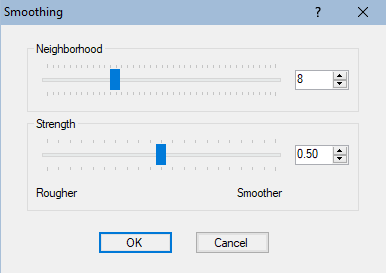 Neighborhood: Sets the size of the brush used for smoothing in meters. The greater the size, the more the smoothing will clear the details of the input mask. Strength: Sets the strength of the smoothing between 0 and 1. A value of 0 produces no effect; a value of 1 produces maximum smoothing. Link the Smooth node to an input node. The values of a mask are smoothed to introduce a blur.